ACF Fiorentina (ACF stands for Associazione Calcistica Fiorentina) has over the years established itself as one of the most well-known Italian football teams even that it belongs to only a midsize city, Florence. In the beginning of 2000s Fiorentina faced an economical crises and after bankruptcy ceased to exist. Since when the club have been founded again with a slight different name. 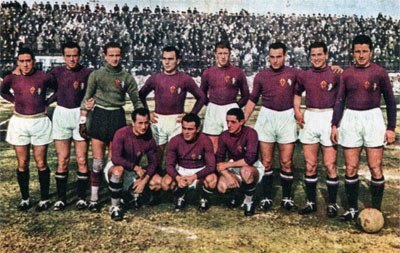 The team in the 40s with purple shirts. CF Fiorentina was founded in 1926, by a merger of two smaller Florentine clubs – CS Firenze and PG Libertas. Even with the hype around a new and spacious stadium being built in 1931, much of the club's next 25 years were spent in the lower divisions of Italian football. The only bright spot was winning Coppa Italia in 1940. The 50s were a lot more successful for Fiorentina. After some consistent top-table finishes in Serie A, the club won its first Scudetto in 1956 with a 12-point difference over the second-place team. They also came out triumphant in 1961, winning both its second Coppa Italia trophy and the first Cup Winners' Cup ever held, defeating Glasgow Rangers in the final. The team that would win the clubs first Scudetto. The next decade also proved productive for the club. 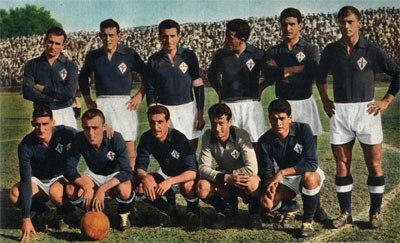 After winning another Coppa Italia title in 1966, Fiorentina won its second Scudetto in 1969 by prevailing over the favored Milan and Cagliari. The club followed it up with a streak of mediocre showings in the 70s, but still managed to win another Coppa Italia in 1975. After Flavio Pontello took over as president in 1980 and started bringing in some marquee signings such as Roberto Baggio, Fiorentina once again found itself at the top. Still, even though they played exciting football and achieved some high-table finishes, the club did not manage to win any trophies during this period. The 90s were much of the same for "La Viola." Even after acquiring some high-quality players like Gabriel Batistuta, the club only won a single Coppa Italia trophy in 1996. The turn of the century brought some shocking news for the fans; the club turned out to be deeply in debt. The drama was culmination in July 2001 when the police did a raid against the house of the owner Vittorio Cecchi Gori due to a money laundering investigation. It was discovered that the club’s financial state was miserable and AC Fiorentina had to declare bankruptcy in 2002. All was not lost, however. After the club's bankruptcy, another one was created in its stead – Fiorentina Viola. The new club was forced to start competing from Serie C2, but still managed to return to the top flight in 2004. Along the way, they re-bought the name rights and went back to being named ACF Fiorentina. The upper part of the kite-shaped crest is dominated by a red fleur-de-lis (a flower of lily) and the lower part has the “AFC” initial written out in lilac background color. 2009-10 Round of 16 Eliminated by Bayern M.